Why Should I Consider a Veneers Dentist in Glenside? Who Should I Choose For Dental Implants in Oreland? Dental veneers are wafer-thin, custom-made shells of tooth-colored materials made from porcelain or resin composite materials designed to cover the front surface of your teeth to improve your appearance. These shells are bonded to the front of the teeth changing their shape, color, or size. Veneers resist stains better than resin veneers and better mimic the light reflecting properties of natural teeth. On the other hand, resin veneers are thinner and require removal of less of the tooth surface before placement. Glenside veneers dentists, Dr. West and Dr. Wilk, have experience with affordable, high-quality dental veneers and are also knowledgeable in how to maximize participation by your dental insurance. When Should Your Glenside Veneers Dentist Recommend Veneers? Teeth that are discolored from root canal treatments, stains from drugs or tobacco use, or excessive fluoride use. What is the Process If I Choose Veneers? Step 1: To prepare a tooth for a veneer, your Glenside Veneers Dentist will remove about 1/2 millimeter of enamel from the tooth surface, which is an amount close to the thickness of the veneer to be added to the tooth surface. Next, your Veneers Dentist in Glenside will then make an impression of your tooth that they will send out to a dental laboratory to construct your veneer. Step 2: It usually takes 1-2 weeks for your dentist to receive the veneers back from the laboratory. Your Veneers Dentist in Glenside will temporarily place it on your tooth to examine the fit and color. The dentist will repeatedly remove and trim the veneer to attain the proper fit. The veneer color can also be adjusted with the shade of cement to be used. Step 3: Next, to prepare your tooth to receive the veneer, your Veneers Dentist in Glenside will be clean your tooth, polish it and etch it to roughen the tooth to allow for solid bonding. Next, a special cement is applied to the veneer as it is placed on your tooth. 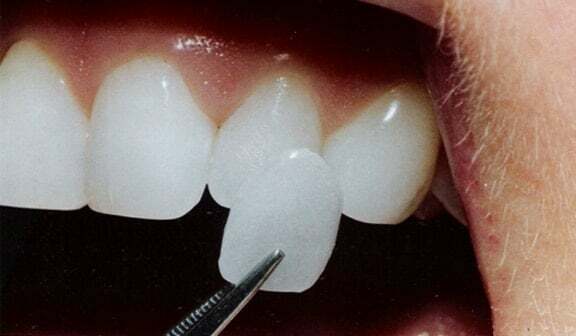 Once the veneer is properly positioned on the tooth, your dentist will apply a special light beam to the dental veneer, which activates elements in the cement, causing it to cure quickly. Step 4: The final step is to remove any excess cement, evaluate your bite and making any final adjustments in the veneer for the perfect fit. With a combined 30 years of experience, Dr. West, Dr. Wilk will create a Veneer Dental solution that will cosmetically correct your issue. Jenkintown Dental Medicine has already implemented the Dental Veneer solution for your neighbors in nearby communities like Glenside and Abington. Call your Glenside Veneers Dentist at Jenkintown Dental today at 215-885-6565.